Message: You've aspired to challenges with great courage and determination. May blessings of peace be with you. The "The Peaceful Blessings Colon Cancer Angel Story"
This precious angel is an inspirational gift for your family and friends who are survivors of Colon Cancer. The angel is a symbol of strength and determination. She holds her wing up high to support all cancer survivors. 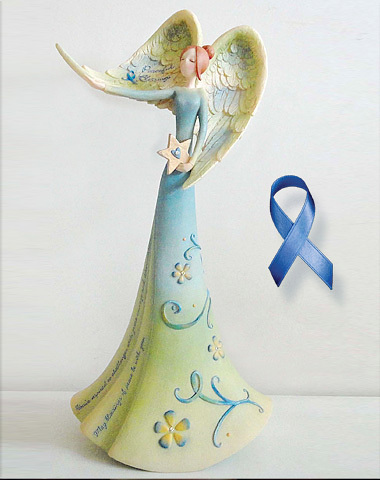 Engraved inside her wing are the words "Peaceful Blessings" beside the blue cancer ribbon. In her hand she holds a star that symbolizes the united effort to battle colon cancer. The shape of the star represents hope for a future without it!